Not all aspects of travelling are light and frothy, spectacular and challenging, joyous or chilled. Countries have histories and within those histories are stories of murder, genocide and tyranny. 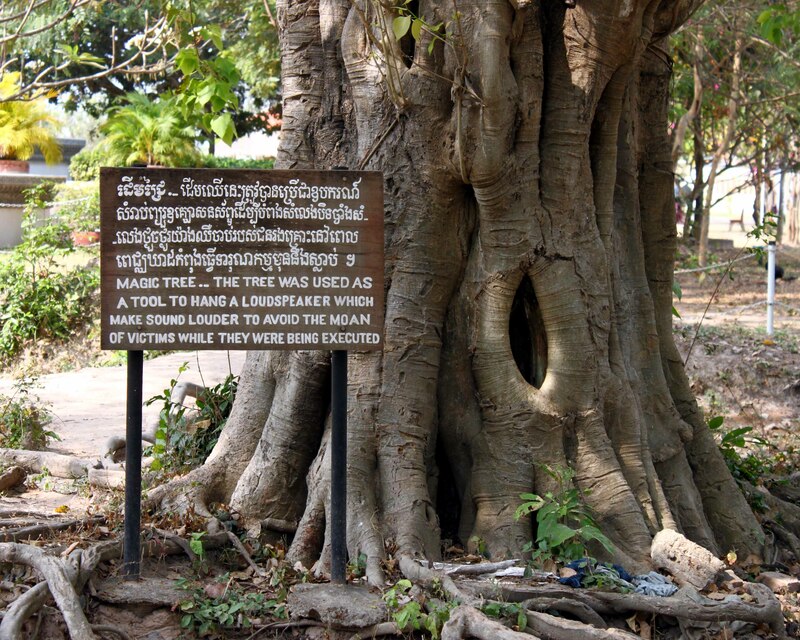 None more so than Cambodia. On my first visit to the country it was apparent that there were missing generations of people – especially the elderly. Stories of hardship, difficult choices, starvation, murder and mutilation were recounted by my hosts on numerous occasions as if the shame, grief, anger, guilt and bewilderment would be dimished the more they shared with the world. 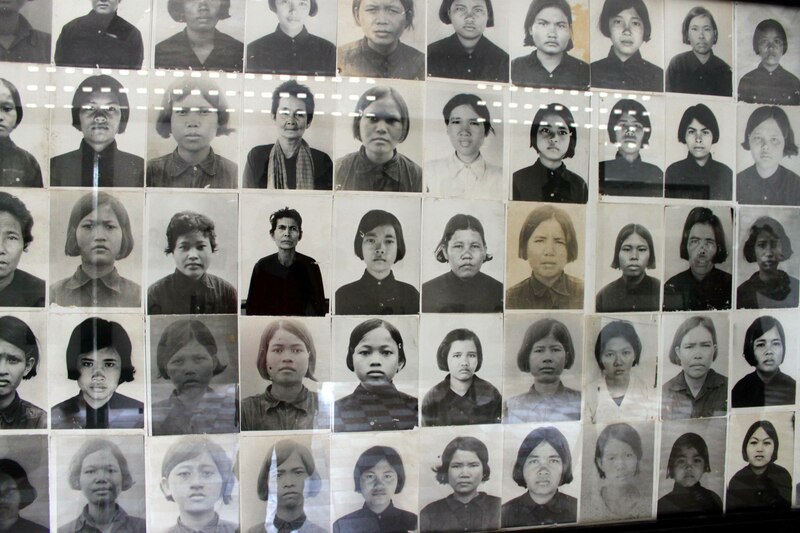 I remember being on the back of a bike when my young driver, who I had known for all of 10 minutes, recounted the decision of his family to smother his grandmother with a pillow rather than let her starve to death, or be taken by the Khmer Rouge. It was one less mouth to feed – a sacrifice for the children of the family he told me. It was one of the hardest things I’ve ever had to listen to, suspending my judgement to hear out a man racked with guilt and sorrow for the murder of his grandmother in an attempt to spare her and to save the others. 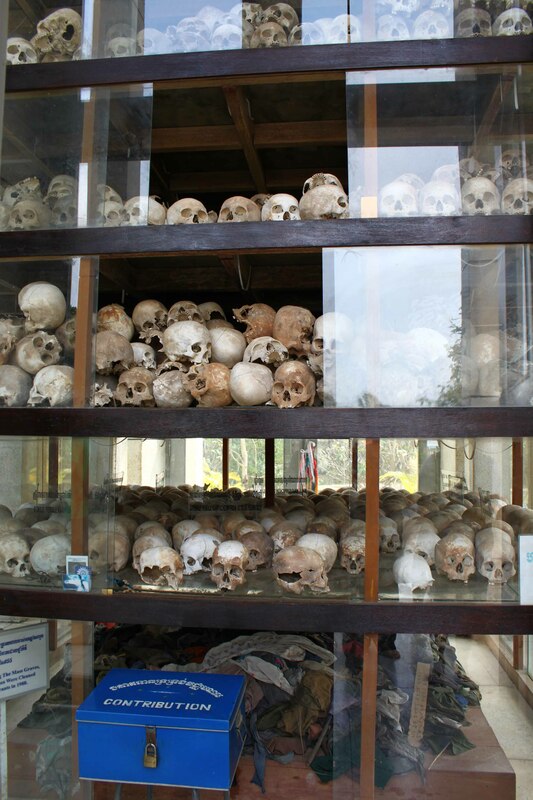 So it was with mixed feelings, on a later visit to the country, that I decided to finally visit S-21 and the killing fields. 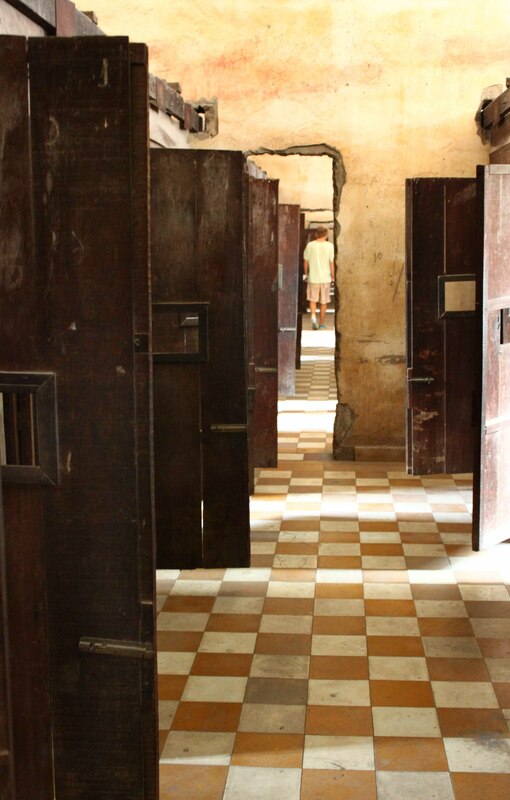 Tuol Sleng Museum, the notorious S-21 was originally a school for children taken over by Pol Pot and his forces in 1975. It became a centre for torture and killing. Some 100 prisoners were killed a day at it’s zenith. 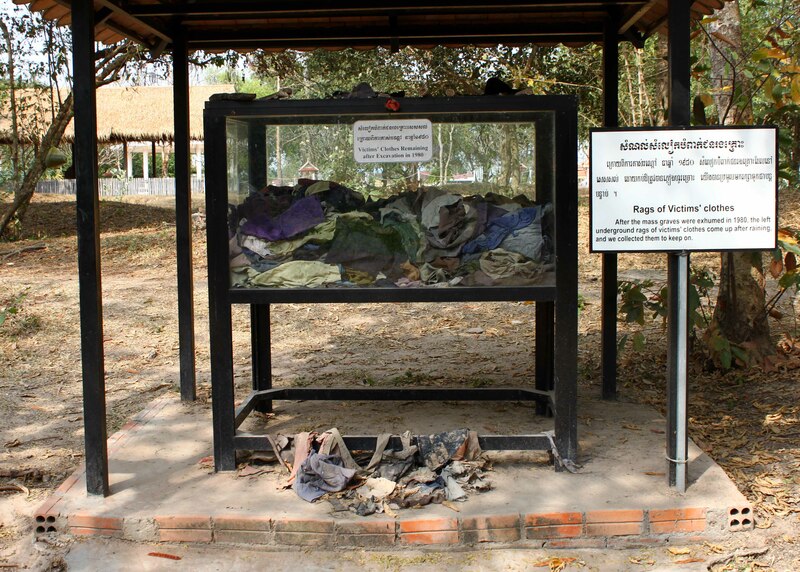 Over 17,000 of its detainees were executed at the killing fields of Choeung Ek. The difference between the two sites is stark. 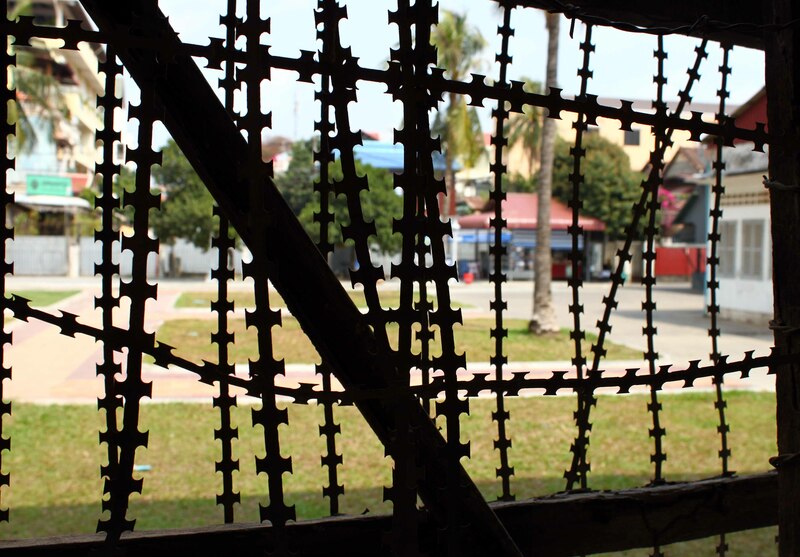 S-21 confronts one with its barbed wire, torture rooms, blood stained floors, photographs of the victims, visual art, stories of survivors and torturers. 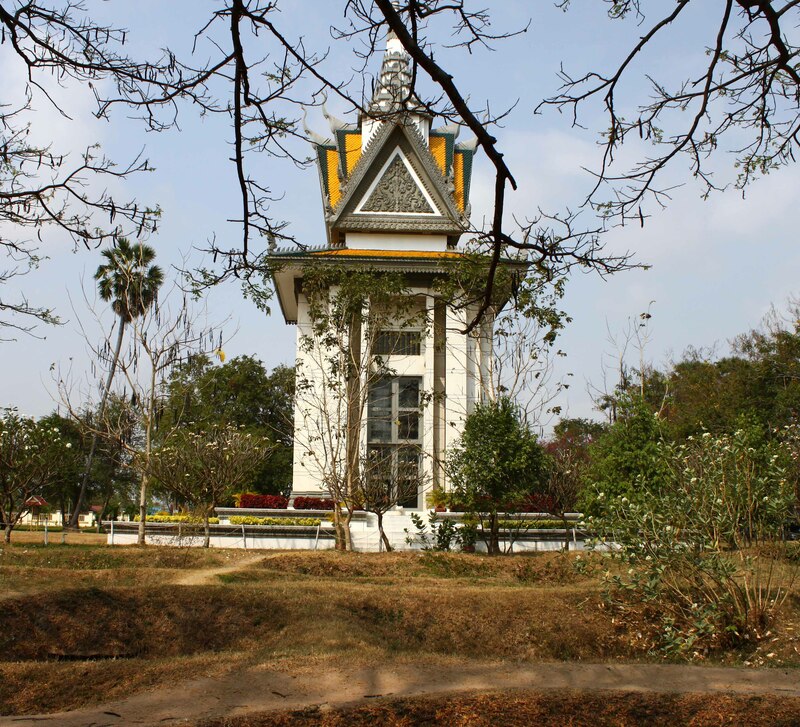 The killing fields is tranquil, green trees and shaded walks superficially disguise what atrocities took place here. But wandering around one finds traces of bones, teeth and clothing rags that have been uncovered by the rain and the horror seeps in. If this doesn’t do the trick the memorial stupa will with its 8,000 or more skulls plus clothing that have been found on the site will. For me, the sites brought home the depths to which man can plummet and the evil that he can inflict on others. But what struck me more was that despite everything the Cambodian people have been through they are still loving, open, kind, friendly, resilient and peace-loving. They send a strong message to the world about survival and forgiveness. I will be interested to see how many hits I get on this blog compared to my others. Sadly I suspect that it will not be a lot. My dear, it seems you were so right. I agree with you, these, unpleasant, episodes form part of the places we visit and are every bit as important as the ‘major attractions’ – more so in this case, in my opinion. 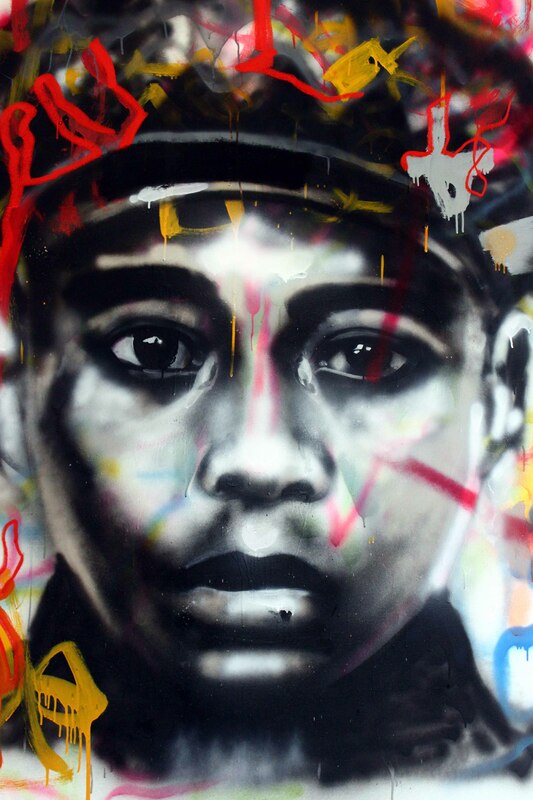 You handled the subject well and with restraint, allowing the photographs to tell the story. Strange, I’m just finishing off a piece I’ve been writing on a small ‘museum’ in the south.